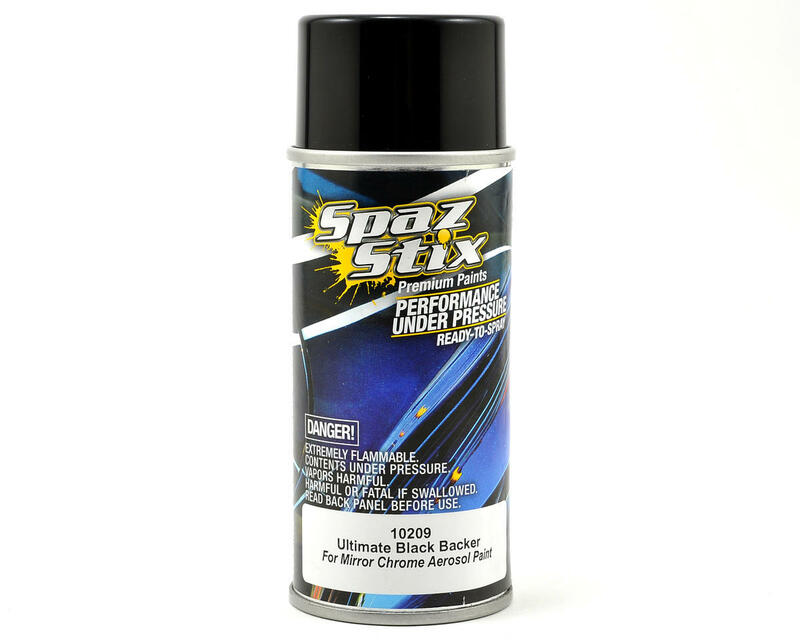 This is a 3.5 ounce aerosol spray can of Spaz Stix "Ultimate Black" Backer Spray Paint. Ultimate Black Backer is specially formulated for use with Spaz Stix Ultimate Mirror Chrome (SZX10009). Backing mirror chrome with the Ultimate Black Backer protects and permits the full reflective properties of the chrome. Can also be used as a backer for the Spaz Stix Color Change paints. Detailed Instructions: Apply Spaz Stix Ultimate Mirror Chrome according to instructions. Allow chrome to dry at least 20 minutes before applying Ultimate Black Backer. Apply at 60° - 80°F and shake for one minute prior to use. Hold can at least 8" to 10" from spray surface and apply in thin layers with smooth continuous motions until desired coverage is achieved. Shake can occasionally. Clean valve when finished by holding can upside down and spraying for two seconds. Wipe residue away from spray tip. This paint has vibrant colors but it chips off off very easily from polycarbonate. Unlike policarbonate paints.